No tae be ramfeeselt wi the neehbourin province o Shanxi. This airticle conteens Cheenese text. Ithoot proper renderin support, ye micht can see quaisten merks, boxes, or ither seembols insteid o Cheenese chairacters. 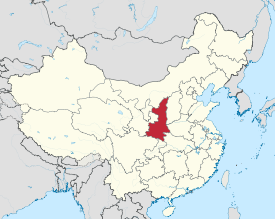 Shaanxi (help·info) (simplifeed Cheenese: 陕西; traditeeonal Cheenese: 陝西; pinyin: Shǎnxī; Wade–Giles: Shan-hsi; Postal map spelling: Shensi) is a province in the central pairt o Mainland Cheenae, an it includes portions o the Loess Plateau on the middle reaches o the Yellow River in addition tae the Qinling Muntains athort the soothren pairt o this province. Shaanxi is the historical hame, alang wi Gansu o the dialect o the Dungans, Hui fowk wha emigratit oot o Cheenae tae Central Asie. Bi regular Hanyu Pinyin rules, if tone marks arenae written, baith Shaanxi an the neighbourin province o Shanxi, tae the east of Shaanxi, shold be spelt "Shanxi"; the difference is in tone: Shānxī (山西) an Shǎnxī (陕西). Tae mak the difference clear athoot tonal marks, the spellin "Shaanxi" wis contrivit (follaein the romanization seestem o Yuen Ren Chao) for the province o Shǎnxī, while "Shanxi" is uised for the province o Shānxī. Shaanxi is the offeecial spellin on Cheenese Govrenment's offeecial web portal. This maks "Shaanxi" the anerlie name o Cheenese provinces that hisnae been romanizit accordin tae pinyin rules. Wikimedia Commons haes media relatit tae Shaanxi. This page wis last eeditit on 28 November 2015, at 05:44.